Goats that have been genetically engineered to produce a spider silk fiber in its milk. With its strength and elasticity, the spider silk has a variety of applications such as providing artificial ligaments and tendons, eye sutures, and for jaw repair. The silk could also have industrial applications in bulletproof vests and improved automobile airbags. 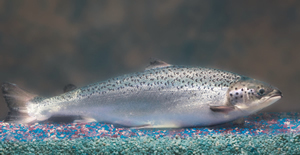 The U.S. Food and Drug Administration (FDA) announced today it will convene its Veterinary Medicine Advisory Committee (VMAC) to consider a salmon that has been genetically engineered to reach its market weight in half the time of conventionally raised salmon. The VMAC meeting, part of a rigorous regulatory process required to assess such technologies before being approved for commercialization is scheduled for September 19-20. At this meeting, the Committee will hear from independent experts about the product’s safety, effectiveness, and environmental benefits; it will also collect public testimony and examine 14 years of scientific evidence about the salmon before deciding whether or not to recommend regulatory approval. The regulatory process for GE animals finalized by FDA in January 2009 ensures the products made available through genetic engineering go through a rigorous review process before being approved for the marketplace. Genetic engineering is a targeted and powerful method of introducing desirable traits into animals using recombinant DNA (rDNA) technology. DNA is the chemical inside the nucleus of a cell that carries the genetic instructions for making living organisms. In January, 2009, the Food and Drug Administration issued a final guidance for industry on the regulation of genetically engineered (GE) animals. The guidance explains the process by which FDA is regulating GE animals and provides a set of recommendations to producers of GE animals to help them meet their obligations and responsibilities under the law. While the guidance is intended for industry, FDA believes it may also help the public gain a better understanding of this important and developing area. The first U.S. approval for a GE animal product came in February 2009 when the FDA approved ATryn®, a therapeutic protein derived from the milk of goats genetically engineered to produce recombinant antithrombin. As the FDA considers its first GE food animal this process may pave the way for new technologies currently in the pipeline. Research with GE animals such as goats, pigs, sheep, chicken, fish and cattle has yielded a variety of products that can advance human health, mitigate environmental impact, optimize animal welfare, improve state-of-the-art industrial products and provide sustainable food sources in agriculture and aquaculture. Genetically modified or genetically engineered (GE) rice in China. The event will take place on Friday, February 12 at the Newseum in Washington, D.C.